Note: A Virtual Teaching Collection is associated with this section. Unaltered fossil remains are comprised of the original materials—and sometimes tissues—produced by an organism when it was alive. These materials have not changed into something else over geological time (i.e., they have not been altered). There are two kinds: unaltered mineralized remains and frozen remains. Many types of ancient organisms constructed shells or exoskeletons out of geologically stable minerals like calcite and aragonite. While the soft parts of these organisms usually decayed away very soon after death, the mineralized hard parts they built are commonly preserved intact, virtually unchanged over millions of years. This style of preservation is very common, especially for many types of marine invertebrates (animals lacking an internal skeleton of bones). 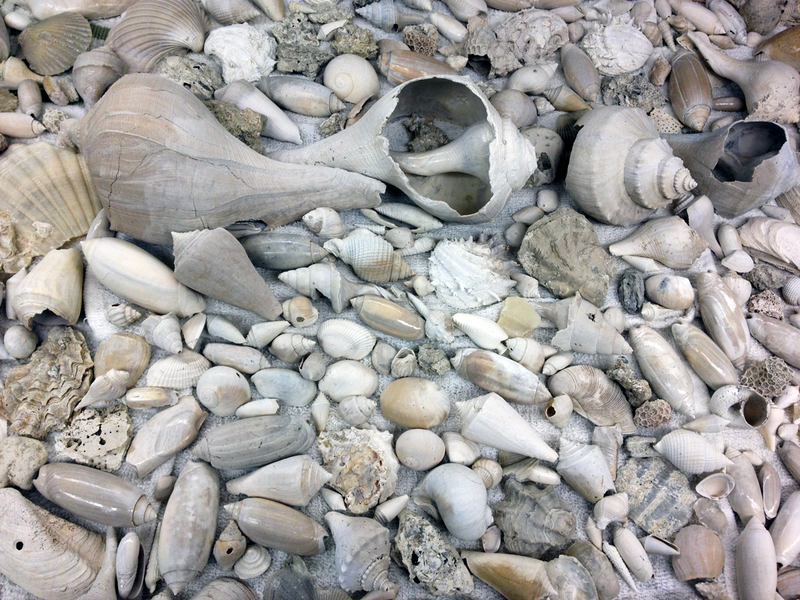 Unaltered fossil mollusk shells from the Neogene of Florida. Image by Jonathan R. Hendricks. This work is licensed under a Creative Commons Attribution-ShareAlike 4.0 International License. Even though bones are mineralized hard parts consisting of calcium phosphate, most fossilized bones are somewhat altered because other minerals have filled their pore spaces (see permineralized preservation). Exceptions include some geologically very young (Pleistocene) fossil bones from places like the famous La Brea tar pits of Los Angeles California (see an overview of this locality on the La Brea Tar Pits & Museum webpage). The bones recovered from the tar pits are little changed from the time when their owners were still alive. In some cases, ancient DNA has been recovered from the unaltered fossil bones of extinct animals, allowing scientists to better understand their evolutionary relationships to modern creatures. The National Center for Biotechnology Information (NCBI)—a national repository of genetic information—maintains an ever growing listing of all the extinct animals (including extinct human species like Neanderthals) from which ancient DNA has been collected, as well as links to the actual DNA records themselves. No style of fossil preservation offers a more complete understanding of ancient life than frozen remains. Fossils with this type of preservation—as the name implies—have been found frozen in ancient permafrost in Siberia. Unlike all other types of preservation, frozen remains allow direct study of the actual soft tissues and sometimes organs that made up an animal’s body. Further, hair commonly covers the bodies of these frozen remains, telling us what color the animals were they were alive. Many different kinds of frozen extinct animals have been found in the Siberian permafrost, including woolly mammoths and rhinoceras, horses, and bison. Remarkable discoveries continue to be made as the permafrost keeps melting in today’s warming climate. For example, in fall 2015, Russian scientists announced the discovery of the only known frozen cave lion remains and another spring 2016 brought announcement of a pair of ancient frozen puppies, fascinating because their age (>12,000 years) has important implications for better understanding the origin of the domestic dog. While frozen fossilized remains offer perhaps the best views of ancient life forms, they are restricted to only the most recent sliver of the geological time scale (the Quaternary period), when large ice sheets covered much of the northern hemisphere. Sadly, we will never find a frozen trilobite or Tyrannosaurus! 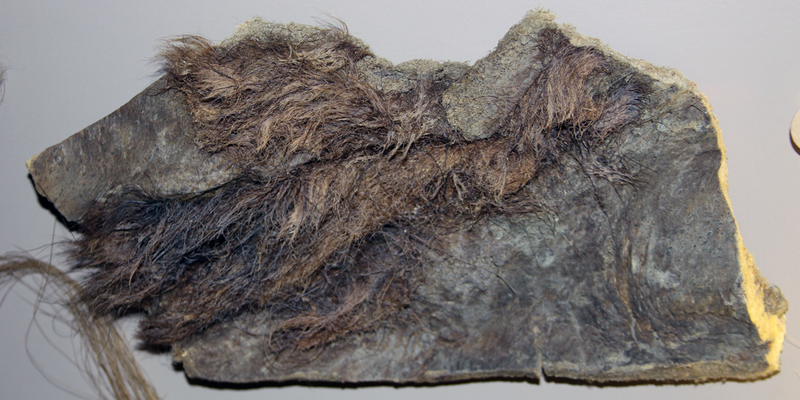 Hair collected from a frozen wooly mammoth specimen. Specimen is on display at the Naturhistorisches Museum Basel. Image by Jonathan R. Hendricks. This work is licensed under a Creative Commons Attribution-ShareAlike 4.0 International License. As their name implies, altered fossil remains have undergone some sort of change: the materials making up the fossil are partially or complexly different from those that the animal produced when it was alive. There are many different types of altered fossil preservation. Most fossil bones and some fossil plants exhibit permineralization. Bone is a highly porous material because space must be available inside to hold bone marrow and other tissues. After a bone is buried, the pore spaces may be filled with minerals (such as calcite or silica) that precipitate out of ground water, forming a cement. (The original organic material, however, is not removed; thus, that material could be classified as unaltered.) This process effectively changes bone to stone. While they may have similar shapes, it is easy to tell apart a modern bone from a permineralized fossil bone because the fossil bone will feel much denser when lifted. This is because there are no longer any empty spaces inside of it. Fossil plants are also sometimes preserved as permineralizations because, like bones, they often also have numerous pore spaces that may be filled with minerals following burial. When viewed under microscope, thinly cut specimens of some permineralized plant fossils reveal cellular-level anatomy. Their quality of preservation is so good that it is nearly impossible at first glance to differentiate them from modern specimens, despite being hundreds of millions of years old. 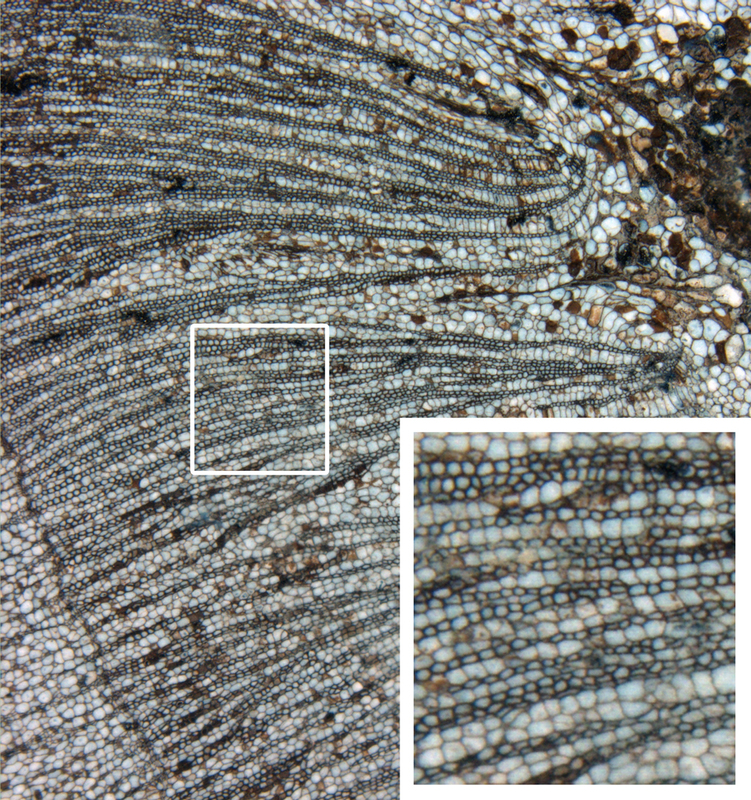 A permineralized plant stem (the cycad Antarcticycas) from the Triassic of Antarctica; inset demonstrates preservation of cellular-level detail. Image provided by the Division of Paleobotany at the University of Kansas Biodiversity Institute and Natural History Museum. Petrified wood takes the process of permineralization one step further: minerals fill the pore spaces in the wood (the air that fills these pores is what makes modern wood float in water) and the original organic material (i.e., the wood) is replaced with minerals. Thus, no original wood remains in petrified wood samples, but these fossil nevertheless tell us a lot about ancient forested ecosystems. A specimen of petrified wood (locality and age unknown) on display at the Natural History Museum, London. 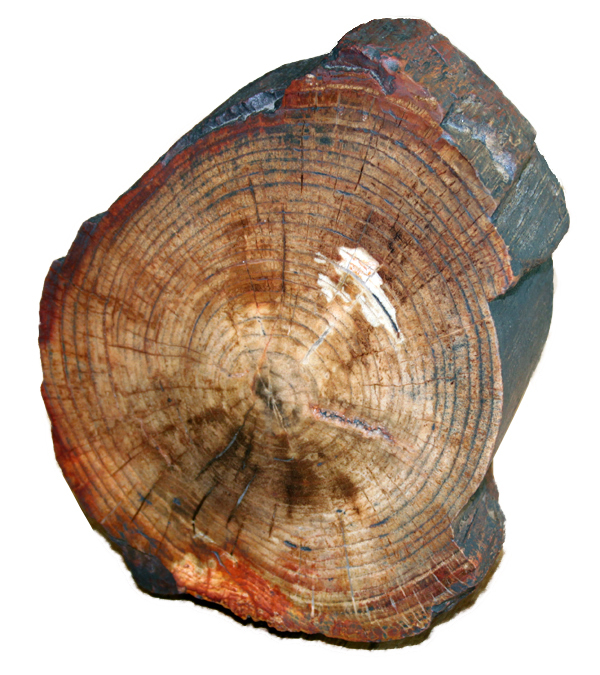 Note the preservation of tree rings, just as might be observed and counted on a modern log. Image by Jonathan R. Hendricks. This work is licensed under a Creative Commons Attribution-ShareAlike 4.0 International License. Fossil specimens exhibiting replacement do not preserve the original body parts produced by the organism when it was alive. Instead, a different, secondary material replaces the original material shortly following the death of the organism. The mineral pyrite (“fools gold”) sometimes replaces calcite, leading to golden colored fossils that are said to be “pyritized.” In some rare cases, the pyrite not only replaces the hard shells of ancient animals, but also the soft parts, revealing features like the legs and antennae of trilobites and entire organisms that we would otherwise not know about. The shell of the brachiopod specimen shown in the model below has been pyritized. 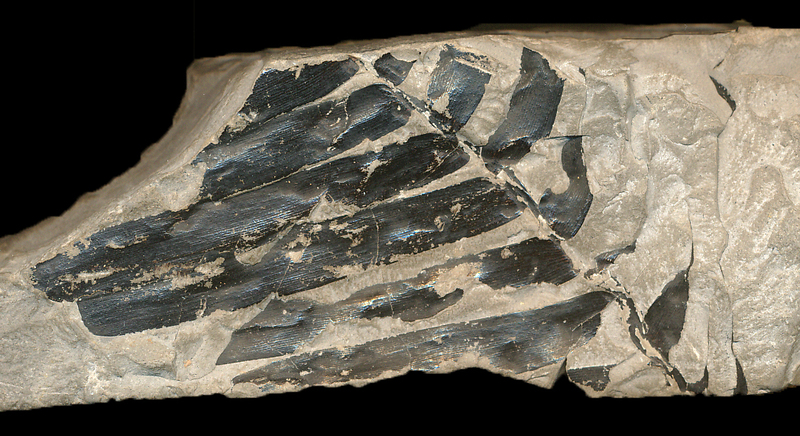 Pyritized Paraspirifer bownockeri from the Devonian Silica Shale of Lucas County, Ohio (PRI 76796). Width of specimen is approximately 4 cm. Sometimes the minerals that comprise the hard parts of organisms recrystallize shortly or long after a fossil is buried. Recrystallization involves a change in crystal structure, but not a change in mineral chemistry. For example, the mineral aragonite—which many mollusks use to make their shells—sometimes changes to calcite, a more geologically stable form of the same chemical, CaCO3. Typically, the overall size and shape of a recrystallized fossil does not vary substantially from the original unaltered specimen, but fine details may sometimes be lost. Carbonized fossil remains (also called carbonizations) may result when organisms are rapidly buried, especially in low-oxygen conditions. Carbonized remains are thin, approximately two-dimensional films of carbon preserved on a flat surface of rock. They are most often black in color, reflecting the fact that they composed mostly of carbon (as is coal, which is also black in color). Most fossils that exhibit “soft part” preservation are carbonizations. Examples include many plant fossils (also known as compressions), insect fossils, and the famous fossils of the Burgess Shale. A carbonized plant leaf (collections of the Dept. of Geology, San Jose State University). Image by Jonathan R. Hendricks. This work is licensed under a Creative Commons Attribution-ShareAlike 4.0 International License. 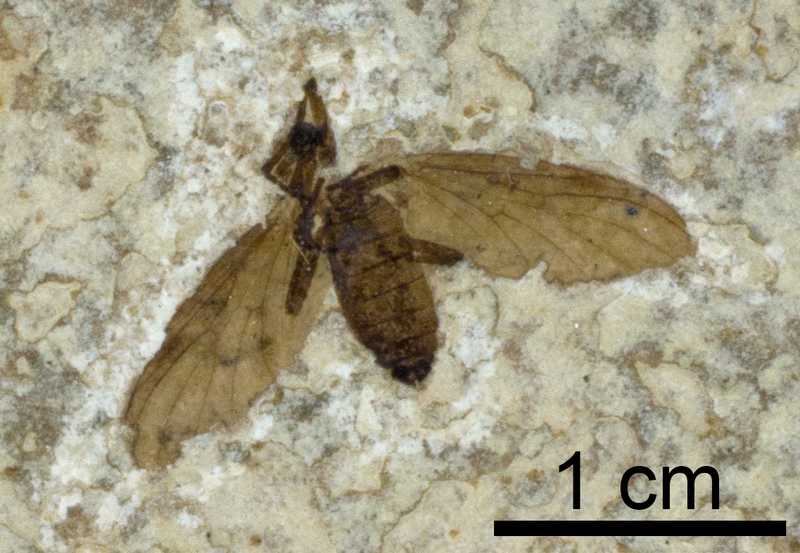 A fossil insect (Plecia pealei, a March fly) from the Eocene Green River Formation of Wyoming, preserved as a carbonization (collections of the Paleontological Research Institution). Image by Jonathan R. Hendricks. This work is licensed under a Creative Commons Attribution-ShareAlike 4.0 International License. Amber is a yellow- or orange-colored semi-precious stone and is frequently used in jewelry. Many people do not realize, however, that amber is fossilized, hardened tree resin. 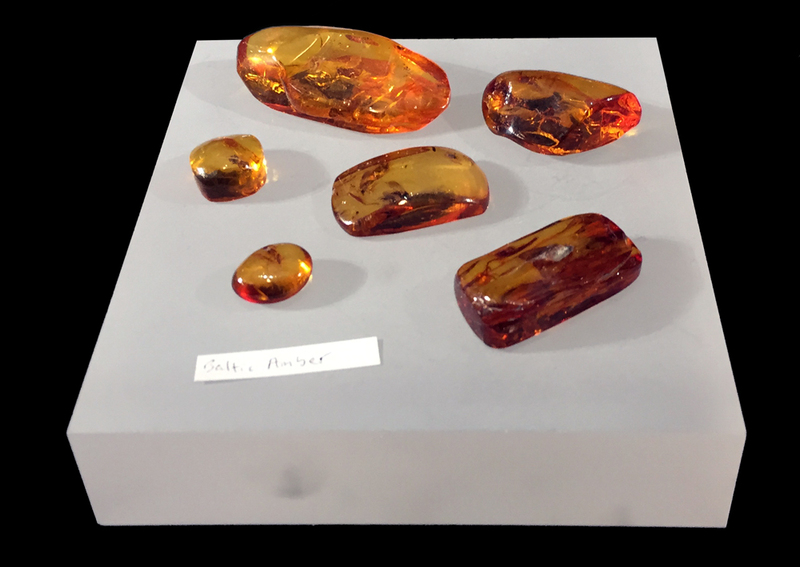 Baltic amber on display in Snell Hall, Cornell University. Image by Jonathan R. Hendricks. This work is licensed under a Creative Commons Attribution-ShareAlike 4.0 International License. Trees ooze out sticky resin (which is not the same as sap) when they are injured, helping to seal wounds and protect the plant from infection. Many different kinds of fossils—ranging from bugs to lizards—have been found locked inside of amber, victims that wandered too close to the once sticky resin. The mode of fossilization of these inclusions varies, but carbonization is most common. Molds and casts are two very common types of fossil preservation and are closely related to one another. External molds are the simplest to think about, as they are impressions. Imagine pushing a modern shell into Play-Doh, then removing it. The impression left behind is an external mold. 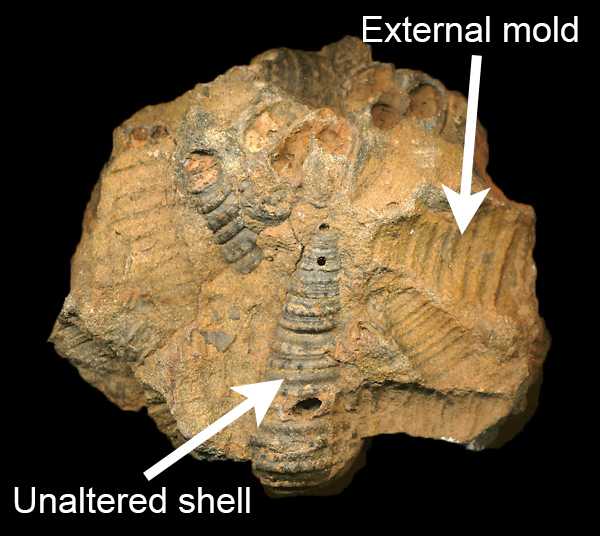 The image below shows a sample with both unaltered fossil snail shells and external molds of the same species of snail (either the unaltered shells fell out at some point or were dissolved away); in this case, the external molds are impressions that were left in the sediment when it was soft and before it lithified (turned to stone). Specimen showing unaltered snail shell remains, as well as external molds. Specimen is part of the San Jose State University teaching collection. Image by Jonathan R. Hendricks. This work is licensed under a Creative Commons Attribution-ShareAlike 4.0 International License. Internal molds (also known as steinkerns) are a little trickier to think about. Imagine a snail shell that has been buried in soft sediment. After the animal decays (poor snail! ), sediment fills the inside of its spiral shell. Eventually this sediment hardens. Now suppose that at some later time, the unaltered snail shell dissolves away. All that may be left is the lithified coil of sediment (perhaps consisting of siliciclastic sediment) that filled the inside of the snail’s shell. This tells us what the inside of the snail’s shell looked like, but not much about the external morphology of the shell. Internal and external molds are often found in association, however, particularly if slightly acidic ground water has dissolved away the calcitic or aragonitic shells, but left behind the surrounding siliciclastic sedimentary rock. Fossil specimen of a strombid gastropod (family Strombidae) preserved as an internal mold; specimen is from the Pliocene Mao Adentro formation of the Dominican Republic (PRI 76798). Specimen is from the collections of the Paleontological Research Institution, Ithaca, New York. Length of specimen is approximately 11.5 cm. This work is licensed under a Creative Commons Attribution-ShareAlike 4.0 International License. Casts form when an external mold (or the void between an external and internal mold) is filled by sediment that later lithifies, reproducing the form of the original organic structure. Most dinosaur skeletons that you see on exhibit in museums are artificial casts made from actual fossil bones; plaster casts are much easier to work with (in part because they are much lighter) than actual bones. The image below shows a natural cast of an ancient camel’s brain (in this case called an “endocast”). How did it form? Sediment filled the deceased camel’s brain case (within the skull) and this sediment later hardened, reproducing the space once occupied by the brain itself. Fossil specimen of a Poebrotherium sp. camel skull exhibiting an endocast of the brain; specimen is from the Oligocene of Wyoming and is on exhibit at the Museum of the Earth, Ithaca, New York. This work is licensed under a Creative Commons Attribution-ShareAlike 4.0 International License.